Valencia, Spain (February 14, 2010) – BMW ORACLE Racing, the American challenger, representing the Golden Gate Yacht Club, won the 33rd America’s Cup Match on Sunday in Valencia, sweeping past the Swiss defender, Alinghi, to a 2-0 victory. This was an historic race for the oldest trophy in international sport, featuring two of the most innovative boats on the planet. BMW ORACLE Racing’s trimaran, USA, powered by the largest wing sail ever built, proved to be the faster of the two multihulls,overpowering Alinghi’s catamaran in both races. Today marks the culmination of the San Francisco team’s 10-year quest for the America’s Cup, sailing’s pinnacle event. 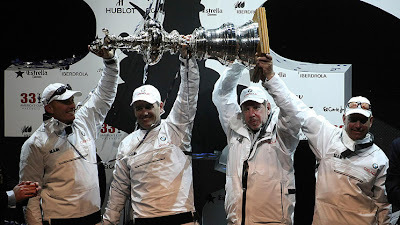 Founded by Larry Ellison (USA), the team is led by CEO Russell Coutts (NZL), now a four time Cup winner, and James Spithill(AUS), the skipper and helmsman of USA. “It’s an amazing feeling,” said Spithill. “The amount of work the whole team has put into this boat and now to go two races without any issues – you just have to hand it to the shore guys, the boatbuilders and all of the support team and designers. They gave us an awesome tool.” “It’s absolutely an awesome feeling,” added Larry Ellison. “I’m really proud to be part of this team. I couldn’t be more proud.” After a long postponement on Sunday afternoon, racing started at 16:25 in 7-8 knots of wind.There was an unusual start to the race, with Alinghi entering the start box very late. In fact, they were on the wrong side of the start box at the 5-minute gun, forcing the Umpires to assess a penalty. BMW ORACLE Racing started with more speed, but Alinghi held held the right hand side of the race course and prospered early when the wind shifted to the right. At one point, the advantage line was as big as 600-meters to the Swiss. 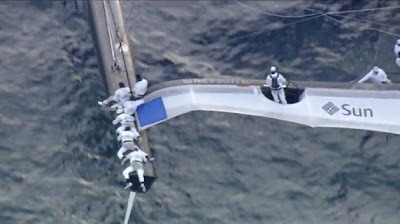 But before the top mark, the BMW ORACLE Racing crew made a perfect layline call. After tacking on the line to the mark, BMW ORACLE Racing saw Alinghi cross ahead, but cede the inside position at the mark to USA, and that was all the advantage the challenger would need to lead around the mark by 28 seconds. From then onwards, the powerful USA boat extended its lead, to cross the finishing line ahead by 5.26. “It was an awesome race. 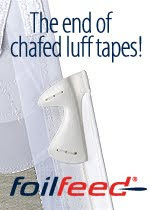 It was touch and go,” Spithill said. “We didn’t see that shift going as far right as it did and that made it pretty exciting early on.” At one point, Alinghi was flying a red protest flag, but the team quickly confirmed after finishing there would be no protest. With the win, BMW ORACLE Racing becomes the first U.S. challenger to win the Match since Dennis Conner hoisted the Cup with his Stars & Stripes team in Fremantle, Australia in 1987. Today also marks the first win for an American team since 1992when Bill Koch’s America3 successfully defended the Cup in San Diego. Reaction from the sailors on USA, along with coverage of the prizegiving ceremony, will follow after the boat returns to port. at: http://twitter.com/bmworacle2010. You can see great images of the team at www.bmor-photo.com.